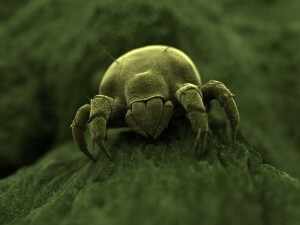 …dust mites can wreak havoc, too! Beds aren’t the only thing in your house that attract mites – carpets and upholstery do as well. And if you don’t take them in hand, the results can be pretty unpleasant – itches, rashes, respiratory problems among them. Adult female dust mites are why you may end up needing to call a professional carpet and upholstery cleaner. Each busy lady mite lays up to 80 eggs in her lifetime, from which six-legged larva emerge. One month later these turn into eight-legged adults, all ready to starting doing some damage. Clinging to fur, feathers or other materials, they then spread themselves around and hide wherever they can. You can’t see these pesky mites (they’re just 250 to 300 microns in length – you need at least 10x magnification to get an idea of what they look like), but they’re no good for your home or you! Among other things, dust mites are bad news for allergy and asthma sufferers. But enough with the horrible details: the good news is that you can protect your carpets and upholstery from these little critters. Regular cleaning helps, as does keeping rooms below 21°C and humidity below 50%. However, most domestic vacuum cleaners, shampooers and steamers, even the ones that boast lots of extra power, haven’t got what it takes to properly take on dust mites and all but neutralise their existence. And, controlling the temperature in your house is far from cheap. To successfully bring dust mites to their knees (if they had them! ), a specialist carpet and upholstery cleaner is a must. Their specialist cleaning equipment, along with their training and experience, is what makes the difference. And, it is a real difference. Summer is a great time to invest in some expert carpet and upholstery cleaning. Take advantage of the warmer, drier weather and start evicting dust mites from your home! For more information on our carpet, upholstery and curtain cleaning services, contact the Apple Clean team on 0800 587 4571.